Caribbean Leeward Islands Superyacht Charter – Superyachts News, Luxury Yachts, Charter & Yachts for Sale. Mediterranean season has come to an end and many yacht charterers are beginning to plan their upcoming winter holidays in warmer climates. Caribbean superyacht charter is a sought-after way of vacationing for discerning travellers wanting to unwind, sailing in the pleasant warm breeze or sunbathing on paradise-like beaches of the Leeward Islands, British Virgin Islands or the Windward Islands, amongst others. Caribbean Leeward Islands superyacht charter is one option that will surely exceed your expectations. Situated half way down the eastern Caribbean chain, the islands include such breath-taking destinations as Antigua and Barbuda, Anguilla, St Barths, St Kitts and Nevis, St Martin or Guadeloupe. Cruising the Caribbean Leeward Islands you will come across a fascinating blend of cultures. In the southern part, such as St Martin and Antigua, a Dutch influence can be felt, whereas Les Saintes have that magic French atmosphere, with Antigua being, without doubt, British. Leeward Islands yacht vacation is well known for magnificent tropical landscapes, beautiful white-sand beaches, crystal clear waters and mouth-watering cuisine. There is also plenty of excitement to take in, including fabulous night clubs of Antigua and classy restaurants of St Maarten. St Barths is the hot spot of the Leeward Islands. The island’s village of Gustavia is Swedish influenced with French culture. It has some of the best restaurants, clubs and shopping in the Caribbean. Mary Jean II yacht is a beautiful 61,70-metre superyacht launched by the well known Italian shipyard ISA (International Shipyards Ancona) and launched in 2010. Her well conceived exterior, naval architecture and engineering are by ISA and her elegant, contemporary and classy interior has been created by Mark Berryman. Some of the most important feature aboard this vessel include the wide open spaces, both inside and out, large lobby main saloon and bridge deck lounge, a superb sundeck with a generous jacuzzi pool, barbecue, a bar, al-fresco dining and an array of sunbathing areas, a tender garage, a gym, an excellent selection of water toys as well as an exceptional cruising performance. Accommodation is offered to 12 charger guests in seven individual staterooms, including 5 double, 2 twin and two convertible cabins. There is a professional crew of 16. Launched in 2006 by the prestigious German shipyard Lurssen, motor yacht OASIS boasts innovative design, with luxurious details and interior designed by Glade Johnson. Her sweeping views evoke an elegant ambience with no shortage for sumptuous and spacious living space. Amongst her many exceptional features belong an open-air sundeck with a built-in bar, a Jacuzzi and barbecue, as well as a professionally equipped gymnasium that can be converted into a private nightclub. Accommodation is provided to 12 charter guests in 6 splendid staterooms. This beautiful Amels Limited Editions 177 motor yacht SPIRIT was launched in 2011, with exterior design by renowned Tim Heywood and interior by the well known Italian design studio Nuvolari Lenard. Spirit offers her guests spacious sun deck, a wonderful entertaining space for up to 100 guests on the top deck also featuring a professional teppanyaki grill. In addition, there is a custom made hot tub, placed at the bow as well as an epicurean style galley. 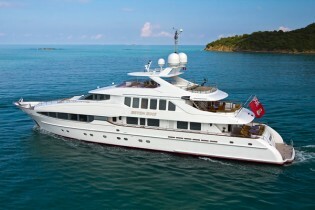 Accommodation is provided to 11 charter guests in one master suite, two VIPs, one double and one twin cabin. With a sleek profile, luxurious interior and a number of exterior deck spaces available for relaxation and entertainment, the Heesen motor yacht INCEPTION is a fabulous vessel to spend you upcoming Caribbean yacht holiday on board of. Her impressive and ultra modern interior, boasting combination of ebony wood with black steel accents, luxurious grey fabrics and brown leather, was designed by Mark Wallace. Comfortable and spacious accommodation is provided to 12 charter guests in one master stateroom, one VIP, tree double cabins and one twin cabin with two pullman berths. There is also an excellent selection of water toys and extras on board. Measuring 160 feet and built by the prestigious Christensen shipyard, ODESSA superyacht is another fabulous Caribbean charter superyacht able to accommodate up to 12 charter guests in 6 deluxe cabins. She is managed by a crew of 10. This striking vessel, featuring a black hull and silver painted superstructure, is sure to get the attention wherever she appears. Her sumptuous interior design was created by Giorgio Armani, in minimalist styling with elegant furnishings. This tri-deck yacht’s exterior areas are vast and boast a huge spa pool on the centreline of the sun deck and spacious deck space to the aft of the sun deck, as well as comfortable seating in the shade of the bar. There is an array of water toys, including a 23ft Chris-Craft runabout, a 16ft Nautica inflatable, a 15ft sailboat, two personal watercrafts, two SeaBobs and much much more. SEVEN SINS yacht is a tri-deck, full displacement luxury vessel accommodating her charter guests in 5 beautiful staterooms and offering plenty of space for relaxation and socialising on her vast deck areas. Some of the main features include the Jacuzzi spa, an aft water toys garage and a sauna. Renowned Omega Architects are responsible for her superb exterior styling and elegant interior design, boasting beautiful semi-gloss cherry wood panelling throughout. The yacht’s ten large windows in the main saloon and dining area enable spectacular sea views. Her upper deck has an al fresco dining option for 12 guests, whereas her sun deck has a table for ten, a Jacuzzi and sun mattresses. Built by Westport Yachts USA, luxury motor yacht ARIOSO is a truly refined Caribbean charter yacht representing style, stability and exceptional service. She is ideal for family charters or for a group of friends. The boat features a tasteful and vast interior as well as exterior, with accommodation for 10 charter guests in 5 comfortable cabins. 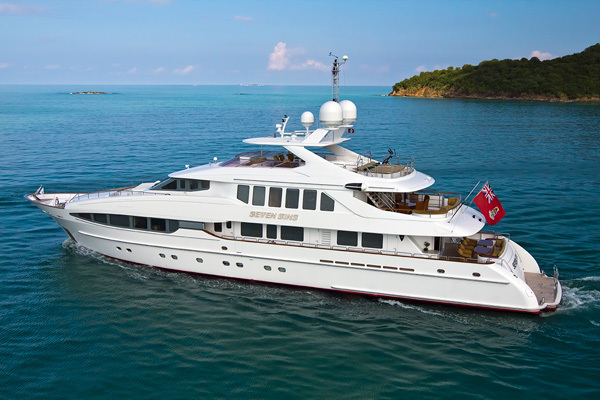 ‘Arioso’ means ‘airy’, which is well fitted considering her spacious open architectural footprint. Her guests are welcomed to relax in the Jacuzzi located on the bridge deck or savour the dishes prepared by her talented chef, grilled on the bridge deck, as well as enjoy the many outdoor seating and relaxations areas, including the wet bar and the swim platform. An absolutely beautiful yacht, constructed by Hakvoort with interior design by Donald Starkey, PERLE BLEUE boasts many outstanding features making her a fabulous vessel to rent in the Caribbean. Her interior combines casual Asian tones with homeliness and simplicity, boasting two comfortable saloons, each with a unique interior theme. The yacht accommodates up to ten charter guests, in one sumptuous Owner’s suite, situated on the main deck and 4 guest suites, all beautifully furnished with a combined Asian and beach-house theme. She is maintained and managed by a professional and friendly crew of 7. Designed by the world renowned Dubois Naval Architects studio and built by Ustaoglu Shipyard, super yacht XO OF THE SEAS is a stable and comfortable rental yacht able to accommodate 11 charter guests in five de-luxe cabins, with a modern and elegant interior. The yacht features light cool neutral tones and expansive windows for ample natural lights. There are ample teak deck areas to enjoy. The aft deck boasts a generous and partially shaded area, with al-fresco dining option and additional seating. The extended swim platform allows for convenient access to the water. The large flybridge features another al-fresco dining table, comfortable seating, large sun pads and a luxurious jacuzzi. Build in 2011 by Johnson the luxury superyacht GO features elegantly comfortable interior with sophisticated décor and an open plan dining and salon area. Her spacious exterior living includes the shaded aft deck and a gorgeous varnished table, full length seating and outdoor upholstered lounge seats with ottomans. Above the flybridge is the ideal place for entertainment and socialising, with a cocktail bar, al-fresco dining, sun-pads and chaise lounges and optional bimini. There are plenty of water toys available, including a wave-runner, kayaks, wakeboard or towable tubes pulled behind a 45 MPH Nautica. Anguilla is renowned for its lovely white sand beaches, gourmet restaurants, de-luxe resorts, astounding villas and very friendly local people. At Flat Cap Point you can snorkel under the cliffs amidst a marine conservation area and at sunset watch the pelicans dive for a meal or catch a view of the endangered ocean tropic birds that nest on the island. Another fabulous diving site are the Prickly Pear Cays, full of caverns, ledges, barracudas and nurse sharks, as well as ship wrecks, including a 1772 natural sinking of the Spanish galleon El Buen Conjsejo. On St Martin you will find a fusion of Caribbean-style beaches with European food and flair, thanks to St. Maarten’s Dutch and French side. The two sides share beautiful beaches, hilly terrain, a host of coves and bays, yet each side has it’s own distinctive pace and personality. The Dutch side boasts art galleries, jewellery stores, casinos and nightlife. The French side is quainter, hosting the village of Grand Case offering plenty of great restaurants. Known as the St Tropez of the Caribbean, St Barth yacht charter offer sublime beaches, stunning geography, exceptional bars and restaurants as well as plenty of designer shops and boutiques. The island’s capital, Gustavia is a small quaint town resembling a typical Swedish village. Situated on the north of the Leeward Islands in the Eastern Caribbean, St Kitts is a relatively small, divided into two halves. The North of the island is immensely lush and green, while the South is more rugged. The coastlines are dotted with traditional West Indian villages, churches, agricultural plots and the occasional windmill or brick chimney from old sugar estate works. Nevis is green and serene, and is one of the last unspoiled destinations, proudly carrying the name “Queen of the Caribbees.” The waters of Nevis are post card crystal clear, in the hills the comical green vervet monkeys chatter, in the sea the whales cruise by. Stroll around and see the architecture of eras gone by: churches, windmills and refurbished Great Houses. Barbuda belongs to the very few Caribbean islands that are and will remain positively deserted, with only a small number of exclusive resorts and villas. Barbuda’s history has been intimately connected to that of Antigua for centuries. Yacht charterers can take a trip to Barbuda’s Frigate Bird Sanctuary located on the island’s northwestern lagoon, accessible by boat. Antigua is the largest of the British Leeward Islands, providing Leeward Islands charter yachts with steady winds, with a network of safe harbours and protective nearly unbroken wall of coral reef. Antigua boasts a beach for every day of the year with plenty to discover. Some of the finest resorts are based here and it is also a home to super luxurious mega yachts, sailing yachts, charter yachts and superyachts for the winter season.